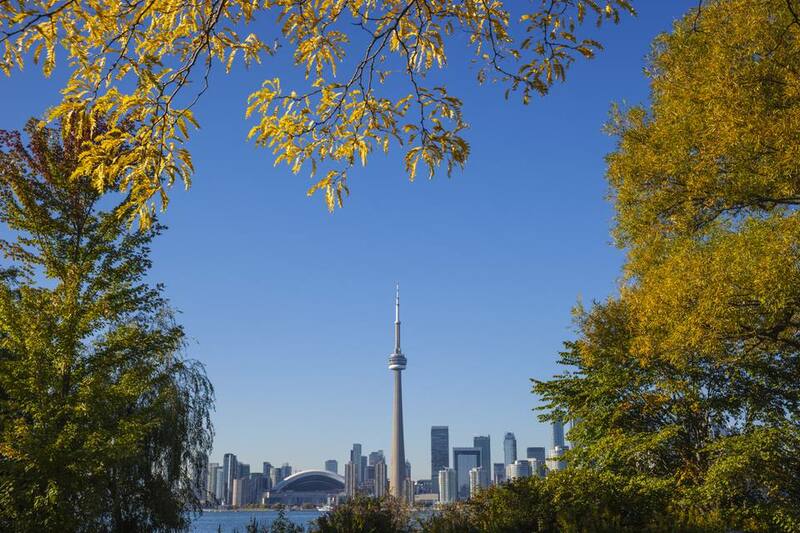 If you can't get away from Toronto a full-blown fall foliage getaway, have no fear. Despite being a dense urban center, Toronto has plenty of green space and thus no shortage of opportunity to enjoy the fall colors, which reach their peak about mid-October. So, pack up a lunch and head to the following spots. Toronto Islands are several islands off of downtown Toronto. Their proximity to Toronto make them a nice, convenient escape from city hustle and bustle, and in fall, gorgeous autumn foliage adds incentive to visit. Toronto Islands boast many public facilities like fountains, picnic areas, volleyball nets and more. Come mid-October, the ferry ride switches to winter hours and only docks at Ward's Island, so check the schedule for times. Centre Island, which is the main draw in the summer, is still open and accessible, but you will have to walk a couple of kilometers to get there. Ward's Island is residential and roaming the pretty streets and imagining the type of life people live there is a pleasant past time. Many attractions will be closed in October, but the walk is nevertheless glorious and you will be rewarded with lovely views of the Toronto skyline. Crowds have thinned out as well. Bluffer’s Park (Brimley Road at the lakefront) offers nature trails, a sandy beach, a marina and other visitor facilities along the foot of the Scarborough Bluffs on the shores of Lake Ontario. The Scarborough Bluffs, which rise 65 m above the water, have been formed primarily by erosion of the packed clay soil. At their western end at Bluffers Park, the Bluffs create a dramatic backdrop for fall foliage viewing. The two to three hour Don Valley Hills and Dales walk is one of Toronto's Discovery Walks, a program of self-guided walks that link city ravines, parks gardens, beaches, and neighborhoods. Signage along the way will help you experience an area's heritage and environment. Many of the dozen or so Discovery Walks will offer fine examples of Toronto fall colors, but the Don Valley Hills and Dales is a favorite as it exposes walkers not only to the glorious Don River Valley but also to Riverdale Farm and the Cabbagetown neighborhood, which is one of the nicest residential spots to see fall colors. The walk is easily accessible from downtown, beginning at the Broadview Subway Station. One of Toronto's most popular parks, High Park boasts views of Lake Ontario and Grenadier Pond and is home to a Carolinian forest, mature oaks, gardens, hiking trails, and an array of butterflies, migratory birds, and other wildlife. In addition, High Park offers many visitor facilities including a zoo, off-leash dog-park, eateries, playgrounds, and parking. High Park is located on the west side of downtown Toronto between Lakeshore and Bloor Street West and is easily accessible by public transit. The University of Toronto campus is located downtown, slightly north of the Financial District and adjacent to Yorkville and the Royal Ontario Museum. The grounds are beautifully treed and thus a convenient spot to pop by for a fall foliage fix. In addition, the buildings are well-preserved examples of Romanesque and Gothic Revival architecture. Get a glimpse into the university's ghostly past with a Muddy York Ghost Tour.